I take my role as an aunt very seriously. I want to be someone my nieces and nephew can always turn to for advice, hugs, adventure, love and support. So it’s important to me to build a good relationship with each of them, which includes quality time together. My recent “quality time” outing was with my seven-year-old niece. I love this age – old enough to have long conversations, young enough to jump into your arms for hugs and kisses, still innocent enough to ask great questions, and still at an age where the world is a big, wonderful place that hasn’t jaded you yet. 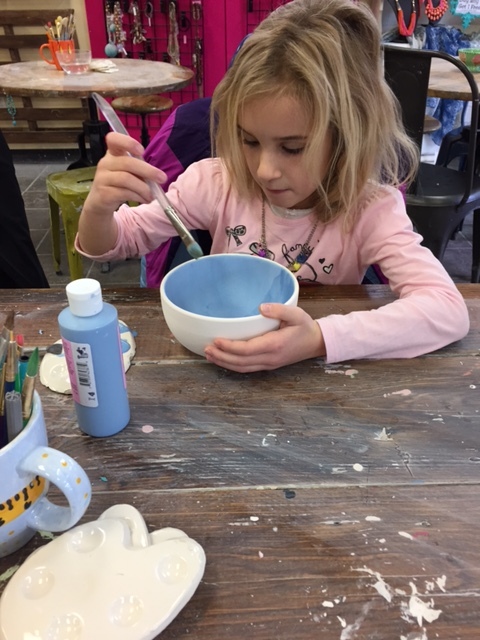 I wanted to do something different with my niece so I picked her up early one morning and we headed to a local pottery studio. I love painting pottery. I don’t consider myself super-talented when it comes to painting but I feel like you can’t really mess up painting ceramics! 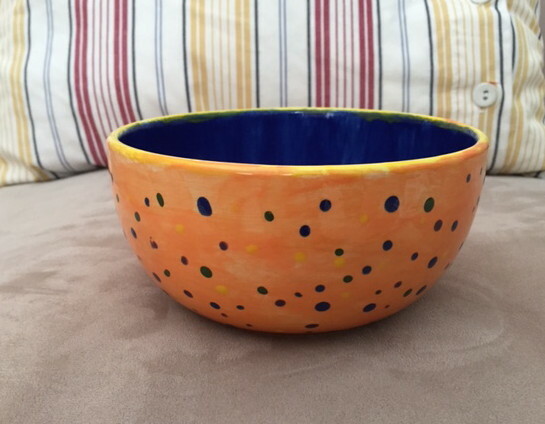 Ok, I suppose you can, yet I give myself lots of creative freedom when painting a bowl, vase or mug (and you should too!). I chose Creative Arts Studio in Royal Oak for our adventure. It’s relatively close to my house and I was there years ago with a group of girlfriends. The studio has greatly expanded their offerings to now include, not just pottery painting, but also mosaics, canvas painting, jewelry making, wheel throwing and more. You can also host birthday and other parties there. Walk-ins are welcome for pottery painting so I was happy that the studio was relatively quiet when my niece and I arrived. We perused the many items available to paint, from bowls to platters to frames to coin banks and more! She finally settled on a cereal bowl. There are plenty of colors to choose from and since she couldn’t decide on just one color, we chose several – blue for the inside, orange on the outside and yellow for the rim. Then we needed to add polka dots, of course! To get the bold colors she chose, we had to paint three coats of each color. I decided not to paint my own item but focus on helping her. Turned out to be a good ideas as her hand got “super tired” after two coats so I finished each color (we are a team in this family!). It took approximately an hour to paint the bowl, with lots of great conversation between us. I knew the outing was a success when she smiled brightly at me, announcing, “This is so fun!” And what started as her bowl soon became a bowl that her sister and brother would “probably be able to use…sometimes.” I love that she has a homemade keepsake from our outing. We had to leave the bowl at the studio to be fired. It was ready one week later and turned out beautiful. It is food-safe. My niece is so proud of her finished product and I’m so happy for the time with her. Creative Arts Studio is located on Fourth Street in Royal Oak. Walk-ins are welcome for pottery painting. It’s an affordable, fun outing – you pay a flat studio fee ($6 for ages under 12; $8 for older) plus the cost of your item. Contact the studio for more information and for information on other activities/projects.